On a cold November’s day in 1539, Henry VIII’s soldiers dragged the last abbot of Glastonbury, Richard Whiting, up through the High Street on a horse-drawn hurdle and then up to the summit of the Tor, where he was hung on a gibbet with two monks hanging either side of him, like two thieves, in a pastiche of the scene at Calvary. But a warning about what…? Why Abbot Richard Whiting and his two monks, John Thorne and Roger James, were murdered by Henry VIII’s men is a mystery…. but one which is being slowly unravelled to me at night, in my dreams. My house is just a few steps from the Abbey walls, and the spirits of the medieval monks often come to me at night to teach me about the alchemy they practised. They have been showing me that the Philosopher’s Stone is an allegory for the process the soul undergoes through many lives in its route of transformation into Christ Consciousness. They are tutoring me in how alchemical teachings were contained in the story of Christ. Of course, an allegorical sub-strata containing alchemical teachings is a million miles from how the religion of Christianity has been taught in the last hundreds of years. In fact, it hasn’t been practised that way since the venerable Richard Whiting, the last abbot of Glastonbury, was murdered on the Tor on that fateful November day in 1539. Until now, it has been a natural assumption to make that Abbot Whiting’s murder, along with that of the other two monks, was just part of the general mayhem which took place during the Dissolution of the Monasteries. But this would be a post-hoc, anachronistic view. In 1539, the wilder, violent excesses which accompanied the destruction of the monasteries were yet to come. Besides, Sir Thomas Cromwell, Henry’s henchman in such matters, had no excuse to take Glastonbury Abbey, let alone the lives of these three august monks, because they had all, to a man, signed their obedience to the Act of Succession, granting Henry VIII the right to divorce himself from his wife, Catherine of Aragon, and the Church of Rome, and to establish the Church of England. So this gruesome assassination was no ordinary act of political suppression. In fact, according to cultural historian Geoffrey Ashe, it was ‘an act of madmen or mystics’. “This Glastonbury savagery was no mere terroristic routine. At the time, it was exceptional and startling. The blacker phases of the English religious upheaval were to come later, during the reigns of Henry’s three children. When their father ruled, the sustained exterminatory impulse had yet to be unleashed … To recollect these things on the top of the Tor is to shudder, not so much at the martyrdom itself, as at the mentality of the men who arranged it. “One senses a hateful darkness, a memory of witchcraft or Druidical rites. For the task which they undertook was so needlessly burdensome. Look down the slope and imagine driving a horse up it, in the mud of late autumn, with a human body on a hurdle trailing behind it: or carrying up heavy timbers required for the gallows: or performing the work of execution on the tiny platform of level ground by the tower, with a perpetual wind blowing. “If the object was to strike terror, the place to do it was in the town. The ascent of the Tor was the act of madmen or mystics … it would not have been possible to remain unaware (or suppose that the perpetrators remained unaware) of the monstrous irony which the Reformation had reared above Somerset: a gibbet on a hill.” From King Arthur’s Avalon by Geoffrey Ashe. In other words, this was a ritual, magical act ~ with the deaths by hanging and dismemberment representing the Black and White stages of the alchemical process, where the various elements are separated and isolated one from another. The third Red stage was represented by the commingling of the red blood with the white spring. So there was nothing logical, rational or even legal about this terrible act. It was a power battle on the magical plains. It was alchemists murdering alchemists; black magicians murdering white magicians. It was also a senseless act .. well, senseless if you don’t understand that the story of Jesus Christ was read by early Christians as an allegorical myth underpinning an esoteric spiritual teaching of self-transformation. It was certainly not carried out in order for Henry VIII to accrue more lands and wealth. When one of Cromwell’s spies, Dr Richard Layton, had visited the abbey a few years before the murders, he had given it a complete clean bill of health with “there is nothing notable; the brethren be so straight kept that they cannot offend,” and Layton, in person, goes on to praise Abbot Whiting to the King. Those last words are very telling: “A good Christian man’s religion,” in those days ~ and still to the present day ~ involves being completely passive in the act of your own salvation. Christians are told that all they have to do is be good, believe in the Bible, and Jesus will save them “through his blood”. They have to follow like ‘sheep’ and, to be honest, they don’t have much choice other than to follow like sheep because all their power to act on their own behalf in this business, to think for themselves, has been stolen from them by the burying of the meaning of the original texts, which most Christians, through no fault of their own, are not cognitively equipped to understand anyway. It is my firm belief and understanding that there is also a magical act at the root of this power grab: King Henry felt threatened by the power of the alchemists as much as he felt threatened by Rome. “There are too many influences on the written documents to get to the true story [of how Christianity was practised in Glastonbury in earlier times],” writes Nicholas Mann in his book, The Isle of Avalon. “Yet this much is clear — early British Christianity stood apart from the orthodoxy created around Rome and Constantinople. “The British Christians drew directly upon the old spiritual practices of the Celtic Druids. They leant heavily towards the Celtic concept of communion with the realms of plants and animals. They tended towards Gnostic beliefs. The British were in the company of those who saw the Bible as providing further allegory and teaching on the ancient and universal truths. One can see from all this, then, why Abbot Whiting and his 51 monks had absolutely no qualms about signing their acquiesence to a divorce from Rome! It was this self-same tract that the Elizabethan alchemist, John Dee, came looking for five hundred years after St Dunstan’s death. So it seems to me that the version of Christianity which the Glastonbury monks were teaching to the thousands of pilgrims that flocked here in medieval times was much more akin to how the Mysteries were taught thousands of years ago, and also more like how spiritual teachers guide their students today. That is, while the Grace of Spirit is attendant to and very much a vital ingredient in the act of self-transformation and the redemption of the blood, a path has been laid down for the adept to follow and it is up to them whether they make the effort to follow it. There is even a labyrinthine, spiral walkway up the Tor which the pilgrims would have used to traverse upwards in the same way as countless Mystery initiates all over the world had done since the early Neolithic period. And they would have understood it in the same way, that the outer act represented the inner journey of the Way. Following the Way is a conscious and deliberate act, making us the agency of our own salvation. It is up to us to work with our spirit guides to perform the inner alchemy and reach the Philosopher’s Stone of Christ Consciousness. This is the true allegorical meaning of the Distillation stage of the alchemical process. The metaphor for this stage was of a Pelican feeding her young with her own blood which she brings forth by pecking her own breast. An illustration of this is found in an engraving in the Abbey. 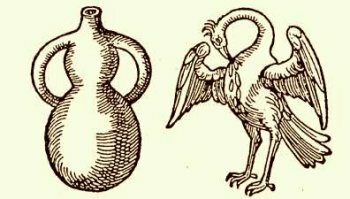 The medieval alchemists would actually use a container called a Pelican for this process, in form of a glass retort with two tubes connecting the long neck with the lower part of the apparatus. “The result was a reflux or rectification still, in which the mixture was boiled and vapours condensed in the neck and then flowed back into the boiling liquid through the tubes. This inner circulatory process produced a very pure essence from the original mixture.” Dennis Hauck, the Complete Idiot’s Guide to Alchemy. Another important stage in the workings is the production of the Philosopher’s Stone which comes after the first stage, the Black Stage, at which all the elements are purified and isolated one from the other, and the dross is removed. The monks have given me to understand that the Philosopher’s Stone was represented by the Celtic Cross. In fact, one can easily see the similarity between the Celtic Cross and the Monas Hieroglyphica which was the Elizabethan John Dee’s symbol for the Philosopher’s Stone. Even the word ‘cross’ has a hidden meaning. ‘Cross’ in Latin is ‘crux’, and ‘crux’ can also mean ‘cauldron’ or ‘crucible’, both containers used by alchemists. The monks have been showing me what is meant by the Philosopher’s Stone, as a stage in the process of self-transformation, and how it is achieved. I already knew from reading about the history of alchemy that the Philosopher’s Stone was also referred to by medieval alchemists as the Child of the Philosopher, but my night-time visitors gave it a name that I haven’t heard anywhere else ~ the Child Tension Victory. The victory is achieved when the Philosopher’s Stone is formed, and it is a victory well-won because it is such a crucial stage of the alchemical process. If the slightest impurity remains in either of the two opposing elements, it can all go wrong and the work has to be jettisoned in order to start again, from the beginning. That’s why the Child Tension Victory is described as a victory if one can achieve it, but I don’t think alchemists use that term today. They call it the Conjunction, which comes after the White (separation) stage. 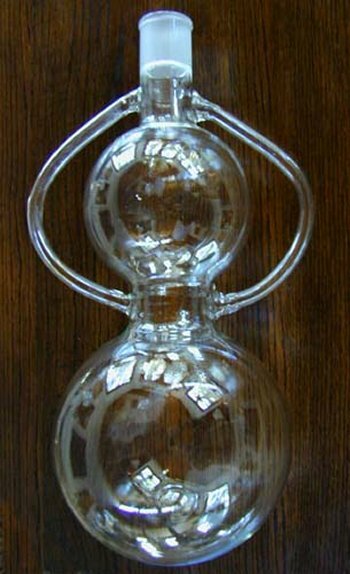 Vessels to perform the Conjunction consist of two glass globes or sections which are joined by a middle chamber in which the mixing or commingling of essences occurs. An illustration of a metaphor for this alchemical process can also be found in the Abbey. But it is hidden by water and even if we drained the water, I don’t know if we could see it because it is may possibly only be visible to those journeying through the liminal walls to the extra dimensions. Here’s how I know about it. A friend was meditating by the Fish Pond in the Abbey, a few weeks ago, and she was very quickly taken through the veil. She saw a ‘faery door’ at the side of the pond, and she flew through it to find a monk sitting there, at a desk, writing with a quill. He tried to shoo her away but then she turned to look back out of the door at the pond, and there she saw that the water had disappeared and in its place was a geometric diagram consisting of a red circle next to a green circle with a Celtic Cross in between the two. My friend has no knowledge of alchemy and so didn’t know what the image meant. But when she told me about it, because of my nocturnal trainings with the monks, I realised that it was the Conjunction phase, the Child Tension Victory, and that the tension between the polar opposite colours of red and green had produced the Child of the Philosopher, aka the Philosopher’s Stone, which is represented by the Celtic Cross, itself representing the Christ Consciousness. I don’t know where all this is leading to. But I felt I needed to get down in my blog everything I’m learning from the monks so far. I will continue to publish their teachings here until we can start to see something taking a more definite form through the mists of this alchemists’ lab of Avalon.